The people who’ve played music with Meg Duffy speak of their guitar playing in otherworldly terms. Erin Birgy of the mystifying Seattle band Mega Bog says she and Duffy (they/them) believe “that songs and music are spells and magic that take a lot of work and care to perfect, to responsibly release ‘out there.’” Austin via Albany songwriter Olivia Quillio says her and Duffy’s innate musical connection “seemed magical,” and the language of songwriting between the two of them speaks more fluidly than words. Acclaimed guitarist William Tyler (formerly of Lambchop and Silver Jews) remarks that Duffy’s performance balances “passion and sympathy,” two curious traits to select while describing the way a person plays an instrument. Even Duffy considers playing music as a sort of transcendental practice. All of these accounts would be heavy-handed if they weren’t such accurate descriptions of the way Duffy’s music sounds and feels—two separate sensations that they’re so brilliant at melding into one. The music they make under the name Hand Habits is windswept, pastoral indie-rock with an old-soul folk spirit. placeholder, the second Hand Habits album that just dropped in March, is full of loping, nodding tunes that exude an all-the-time-in-the-world level of patience. Their music has been fairly characterized as “chill,” but slapping it with the same tag one would a Mac Demarco record, or a lo-fi hip-hop beats compilation, is criminally underselling the vivid color Duffy conjures out of an otherwise grayscale palette. Take a placeholder standout like “jessica,” where Duffy’s murmuring vocal hook is as valuable a melodic component as their starry, flickering guitar solo. In one of the record’s more jittery cuts “can’t calm down,” Duffy’s masterfully layered solo crawls out of the clean lead riff, pitter-pattering between the left and right channels and illuminating the whole mix before abruptly burying itself. It’s the aural equivalent of heat lightning, a common sighting in the California locale where these songs were conceived. However, long before Duffy was writing their own songs that earn praise from The New Yorker, Pitchfork and NPR, and playing guitar on albums by Weyes Blood, Kevin Morby and The War On Drugs’ grammy-winning A Deeper Understanding, they were cutting their teeth as a guitarist in the Capital Region. An Amsterdam native, Duffy enrolled in Schenectady County Community College (SCCC) after high school and studied guitar performance for two years. Prior to college, Duffy played in cover bands with their friends in high school, rehashing everything from Led Zeppelin and Pink Floyd to Weezer and Sum 41. However, Duffy’s SCCC program was mostly jazz-based, which allowed them to scratch their itch to play more complicated, rootsy material. Motivated by being the only non-male in the program, Duffy practiced voraciously and often at the expense of their other classes. However, they felt welcomed by their peers and inspired by their part in the program’s little community, which was rich with first-rate students and professors. Their studies were integral in nursing their desire to take music seriously, but it was the Capital Region local scene, particularly the DIY folk and rock sectors, that served as Duffy’s jumping-off point. One of their first collaborators was Quillio, a forward-thinking jazz singer/songwriter who had dropped out of SUNY Potsdam to pursue music full-time while living in Troy. The two first met when Duffy approached Quillio at her coffee shop job upon recognizing her through a mutual friend. Duffy says that they had been playing guitar for almost six years before they wrote a single song. However, Duffy also just liked playing guitar for other people’s music—which they still do, as they’re an accomplished session musician outside of Hand Habits. They played with Quillio for about four years in the early 2010s, which helped them hone their skills and learn to play in a way they hadn’t previously. “I definitely found that [sic] role of being someone else’s guitar player creatively, and not overtly—and knowing where to take space and knowing what to bring, and making like loops and stuff…and bringing a lot to the table as a guitar player and not just being the person who takes the solo. I felt really comfortable doing that and just letting someone else shine and just adding to what they were having to say,” Duffy says. Quillio stresses that their musical relationship was profoundly beneficial for both of them, and the special bond they shared while playing is unlike any she’s ever experienced. Despite feeling timid about writing their own songs, Duffy was strikingly confident at asking to play in other established bands throughout the area. The aforementioned songwriters introduced them to the Albany scene in the early 2010s, which included popular local bands like Aficionado and Better Pills. But Duffy wasn’t afraid to approach these musicians and convince them they were worthy of contributing to their sound. 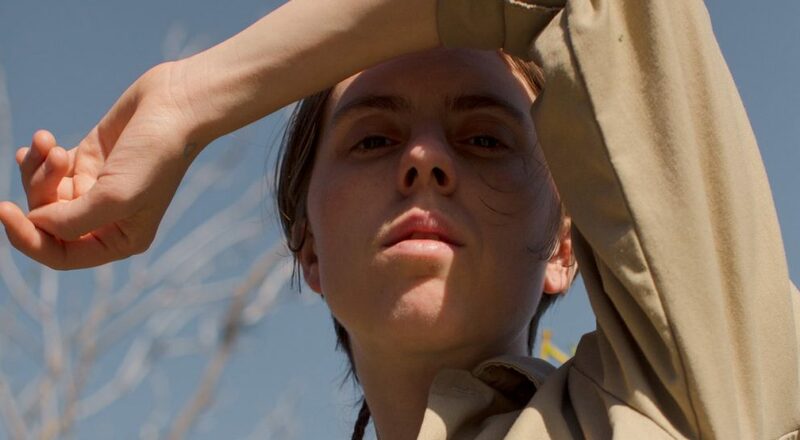 At some point during that whirlwind time period, when they were living in a house on Madison Avenue in Albany with Quillio, Emily Sprague (Florist) and Jonnie Baker (Florist, Bellows), Duffy started writing and performing as Hand Habits. They started playing frequently around the area, but Duffy says the band sounded drastically different than it does today. Then one day Hand Habits got asked to play a show in Albany with Mega Bog, a pretty underground West Coast band that Duffy had become obsessed with after stumbling upon their music on Bandcamp. “I was searching the hashtag ‘cave.’ And I found Mega Bog and I was so into the music,” Duffy remembers. They now have two Mega Bog tattoos. Reflecting on their charming naivety, Duffy remembers that they were elated to meet Mega Bog songwriter Erin Birgy when she arrived at the venue. Unfortunately, it didn’t go as well as planned. Birgy remembers being taken aback more than anything. The awkwardness of their initial interaction didn’t sway Duffy from making their biggest ask yet, though. A few months later, in 2014, Mega Bog posted a Facebook solicitation for a touring guitarist, and Duffy responded vigorously until Birgy eventually agreed to bring them down to NYC for an audition. Birgy promptly asked them to join the band and Duffy began touring with them around the country, eventually playing on Mega Bog’s 2017 album, Happy Together. Duffy says they learned a lot from playing with Birgy, a deeply unconventional songwriter with a keen sense for abstract melodies and genre-bending arrangements. The music was unlike anything Duffy had ever been forced to play previously, but they say that Birgy trusted them unflinchingly and gave them a lot of freedom in the studio. “She would give a sound and be like, ‘I want it to sound like [makes a caterwauling shriek].’ And I would figure out how to make that sound because I wanted her to be proud of me because I also looked up to her so much as an artist, and still do,” Duffy says. About a year after that initial run of dates with Mega Bog, Duffy was playing with Better Pills when they had a gig opening for Kevin Morby. The up-and-coming folk-rock songwriter was already well-established, having begun his career in the short-lived, garage-rock group The Babies and then spending some time in acclaimed indie-folk band Woods. Duffy and Morby’s connection was instantaneous. At first Duffy was playing bass for Morby, which they had to teach themselves, having never played it before. Eventually they moved over to lead guitar, and it was there that Duffy cemented themselves as a nationally-desired guitarist. They played on Morby’s excellent 2017 album City Music, and it was around that time that Duffy moved from the Capital Region out to Los Angeles to begin their career as a session musician. In addition to the aforementioned artists, Duffy has played on records by Miya Folick, Chris Cohen, Amber Arcades, among others. However, their most notable contribution as a session musician remains that War On Drugs album. Duffy still marvels at witnessnessing Adam Granduciel’s intensely perfectionist process. It takes a certain type of person to get drafted by a creative like Granduciel, and Duffy thinks their flexibility and strong work ethic are two of their most attractive assets to a person like him. That being said, Duffy always writes their own parts for the session work they do. “I don’t think that someone needs to hire me to play a part that someone else can play,” they say. An interesting observation they’ve made from their career as a session musician is that sometimes they’re not exactly sure what they’re being hired for. As in, what about their specific playstyle is so fitting for a given piece of music. One of their most recent collaborations was for William Tyler’s 2019 record, Goes West. The album is a fully instrumental Americana record produced by big-time studio wiz Brad Cook (Bon Iver, The War On Drugs) that features additional guitarwork from legendary jazz maestro Bill Frisell. In a recent Pitchfork interview, Duffy described their initial nervousness going into that session, and the subsequent comfort from Tyler’s validating encouragement. He’s someone who sees something in Duffy that they themselves might not even be able to pick up on. Although they’re currently rubbing shoulders with some of the most renowned figures in modern rock music, Duffy’s dedicating the rest of 2019 to touring on the Hand Habits record. They’re finally at a place where they’re getting the opportunities they’ve not just dreamt of—but always known that they were going achieve. Quillio emphasizes that Duffy’s setting an example for the rest of the Capital Region—and DIY communities as a whole. “About being confident and continuing to work and holding the light for yourself,” she says. Hand Habits is nominated for ‘Outward Bound Artist of the Year’ for the Capital Region Thomas Edison Music Awards (‘The Eddies’). Winners will be selected by a group of over 60 area judges and presented on April 14. Hand Habits play The Church in Troy on April 8 at 7 PM and The Half Moon in Hudson on April 9 at 8 PM.